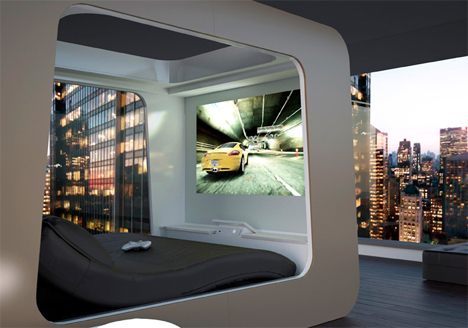 It’s half futuristic self-contained entertainment pod, half serene sleeping chamber. The HiCan bed was obviously made for the people who slept in racecar beds in their childhood. The all-in-one bedroom entertainment center has so many awesome features that it’s hard to imagine you’d ever leave bed again with this at home. In fact, as long as you’ve got a phone by the bed and the pizza guy is willing to deliver straight to your bedroom, you’ll never need to leave it. The HiCan has all those features that you’ve probably always wished for, but never dreamed anyone would actually put on a bed. If you’re lazing around on a weekend afternoon and feel like checking out a movie, you just pull down the projection screen at the end of the bed. Likewise, the integrated video game system is ready to go whenever you are, so you can smash some bad guys while your beloved snoozes away beside you. Is the sun through the window a little too bright while you’re surfing the web from the built-in PC in your HiCan? Believe it or not, you can control your home’s blinds, full-house lighting and entertainment system from the bed’s controls. Lights are included to help you read (if you’re into hard copies of things). 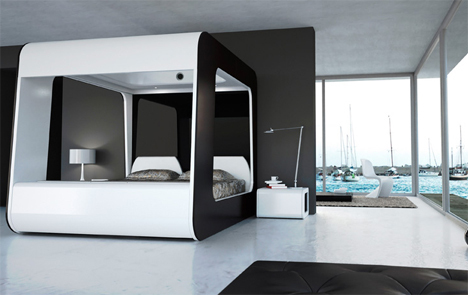 And if you finally get tired of playing with all of the bells and whistles on this amazingly cool bed, you can pull down the built-in shades and block out the outside world. Getting some shut-eye has never been so exciting. 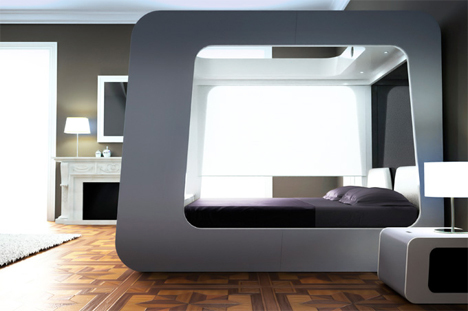 The company’s philosophy states that the very cool bed was conceived with the idea that we have so much going on in our modern lives that we should have a comforting place to retreat to. 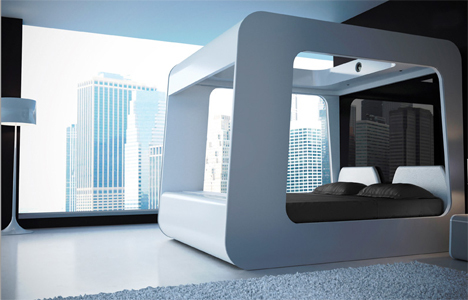 The HiCan could conceivably replace all of the furniture in a tiny apartment…provided that you can shell out the 42,000 Euro (about $62,000) for one. See more in Audio & TV or under Gadgets. October, 2009.